Making the infrastructure investment is one of the biggest challenges for high speed rail. High speed rail infrastructure costs are truly significant--particularly as speeds increase. They include right of way acquisition, bridge and tunnel construction for grade separation, preparation and construction of the rail bed, electronic safety systems, train stations, and so forth. All these require massive amounts of capital to get high speed trains running. Moreover, the capital requirements grow exponentially as train speeds increase, particularly as speeds increase beyond 110 MPH. As speed increases, grade engineering and safety costs begin to skyrocket. 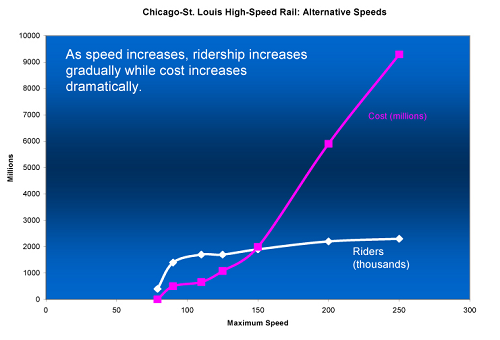 The graph below, from an Environmental Law and Policy Center article, depicts the relationship between ridership growth and costs for the Chicago-St. Louis route at different speeds. Ridership does increase as speeds increase, but costs rise dramatically at speeds over 150 MPH. So, what's a possible solution? I'd like to comment on a strategy that reduces the demand for capital outlays. For the most part existing rail infrastructure can be improved and used for trains operating at speeds of 110 MPH or less. Leveraging existing infrastructure investment is far more cost effective than making the outlays required for really high speed trains. This translates into huge savings in infrastructure costs. Of course, advocates for much higher speeds rightly point out that studies show greater ridership as train speeds go beyond those modest speeds. But although the ideal goal may be much higher speeds, the added cost to move from a good solution to the ideal solution may be too big a leap to make at this time. Just getting trains to 110 MPH speeds would be a great improvement within the Midwest, and those speeds - coupled with more frequent service - would increase ridership and generate significantly better returns on capital investment. It's an incremental approach that moves transportation options forward in this country in a significant way--with less risk and less initial investment.